Curtains are a great way to add texture and style to rooms. It’s fun to experiment with different fabrics and patterns. But many people forget about the visual impact a curtain rod can have in a room. Just as shoes complete a look, curtain rods complete window treatments. They support the curtains, frame the window and set the tone of the space. Choosing the right curtain rod is just as important as choosing the right curtains. But sometimes, your style deserves more than what the big box stores have to offer. When a traditional curtain rod won’t do, try one of these fun, creative ways to hang curtains without a rod! Tumbled and weathered to perfection, driftwood is the perfect complement to any rustic window treatment. Stroll the shoreline instead of the store aisles to find the perfect piece. Consider choosing curtain types like tab-top or eyelet with a generous grommet size to make opening and closing the curtains over knotty driftwood a little easier. Whether you’re hanging sheer curtains for the summer or heavy drapery for the winter, using driftwood is a great way to accent a room and create a more natural feel. Gold Pipe — DIY Not? Get crafty! Add elegance to an industrial style by spray-painting a copper pipe gold. You can spray paint the curtain hangers as well to complete the look. Your local home improvement store will have all the supplies you’ll need. Use pipe elbows and connectors to create different shapes that suit your style. Make sure to select a high-quality, scratch-resistant spray paint to lessen the appearance of wear and tear. Make installation easy by using Kwik-Hang curtain rod brackets. Don’t be afraid to loosen up the look of your space by using a decorative rope to hang your curtains. Rope softens the lines around window frames and relaxes the feel of a room. Create tension in the rope by tying the ends directly to the curtain rod brackets. You can also use curtain tieback hooks to secure the rope further down the wall. Avoid hanging heavy drapery when using rope in place of a curtain rod. Use curtain rings with clips to make opening and closing the curtains a breeze. Any excess rope can be used to create matching curtain tiebacks. When it comes to man-cave renovations, not just any window treatment will do. Why not consider reviving that old fishing rod the man-of-the-cave put to rest long ago? This DIY option allows the angler in your life to dream of their next expedition every time they enter the room. Installation is ridiculously easy, so there won’t be any fish stories about all day projects or multiple trips to the hardware store. Simply tap in a pair of Kwik-Hang curtain rod brackets and mount the fishing rod and curtains to the window frame. Voila! Make your child’s room Instagram-worthy by getting creative with sports equipment. Complete the look of any young athlete’s bedroom and add some fun around their window frame by using something sporty in place of a traditional curtain rod. Lacrosse sticks, hockey sticks and ski poles are just a few great examples of what you can use. It’s fun to get creative with window treatments, and it should be just as fun to install them. 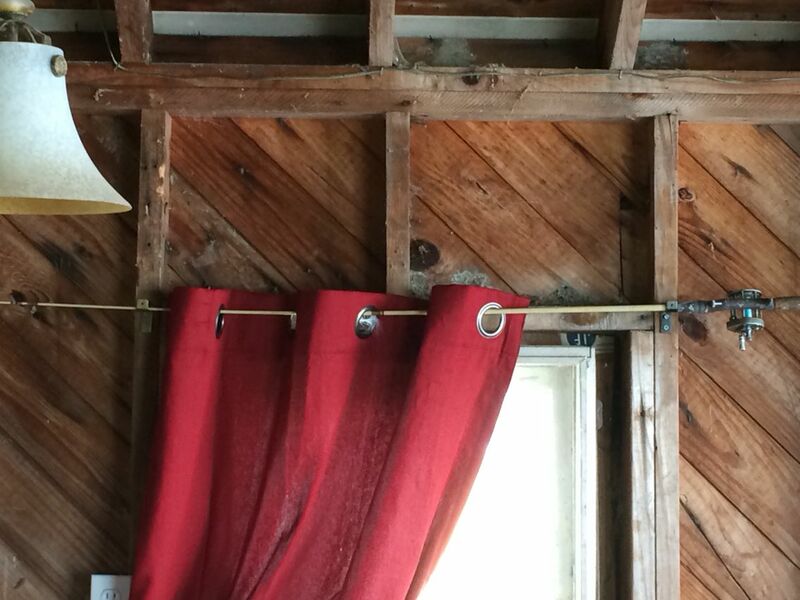 Avoid the stress and messy drywall repairs that come with traditional curtain rod hangers and try Kwik-Hang’s no drill, no damage curtain rod brackets. With Kwik-Hang’s revolutionary curtain rod brackets, you can put the stud-finder and spackle away. Fit the Kwik-Hang brackets to the top of your window trim, tap them in with a hammer and you’re ready to go. Fast, simple, stress-free. Skip the mess and have more fun decorating your space with Kwik-Hang curtain rod brackets. © 2018 Kwik-Hang Curtain Rod Brackets.